I am known by many names, but most simply call me. Click here to play! .. Cashanova. No, not Casanova. No, Cash- With a 'sh'? Okay, forget it. Just call me 'Bob' if you're going to be that way. Okay, so you have it right, now? With a 'sh'? Good. You will find that I am a far better lover than my cousin, Casanova. You see, I have a technique that he has never quite been able to pick up for giving pleasure to anyone - man, woman, or some kind of creature from another planet. It is very, very simple to learn, but quite difficult to pull off. All you have to do is... GIVE THEM BUCKETS AND BUCKETS OF CASH! The Cashanova slots feature Roger Rooster starring as Cashanova, in a quest to win the heart of Henrietta the Hen by helping you to win buckets of cash in an exciting slots game. Line up Cashanova symbols, Henrietta symbols, smoking pipe symbols, whipped cream symbols and egg symbols to see if both you and Cashanova can get lucky tonight. The Bonus Golden Feather symbol is the scatter and it triggers the barn bonus when these symbols land on reels 1, 2 and 3. The Roger Rooster symbol is wild and substitutes for any symbols other than bonus or scatter symbols. 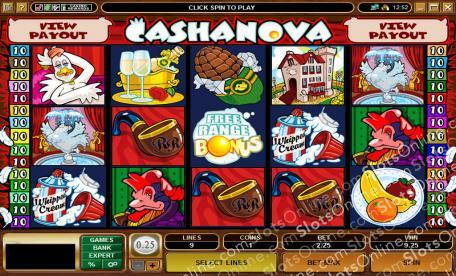 There are a variety of bonus games in the Cashanova slots. The first is the Barn Bonus, triggered by the scatter symbols. In the Barn Bonus, the player chooses a number of items and receives a bonus according to the items chosen. If the Henhouse Key is found in the Barn Bonus, the player wins all hidden bonus amounts in the Barn Bonus which triggers the Get Lucky Bonus, where the player must choose a gift for Henrietta that has awards another bonus amount. The other bonus game to play is triggered by 3 Free Range Bonus symbols scattered on reels 3, 4 and 5. This is the Free Range bonus game, where players choose 1 egg from each of 3 rows of 3 eggs. The first egg reveals a number of free spins, the second a prize multiplier for the free spins, and the third an extra win amount per spin.